Water transfer printing, also known as Hydro dipping, Hydro graphic printing, 3D printing and Camo dipping amongst other names is the process of transferring a pattern, be it wood, carbon fibre, camouflage, flames or one of literally thousands of designer patterns from a piece of PVA printed media onto the surface of an object by means of an ink transfer process. In brief, a Pattern is floated on water and sprayed with an industry designed activator to liquefy it. As the object is immersed in the pattern covered water, the infill of water literally wraps the pattern around the object. 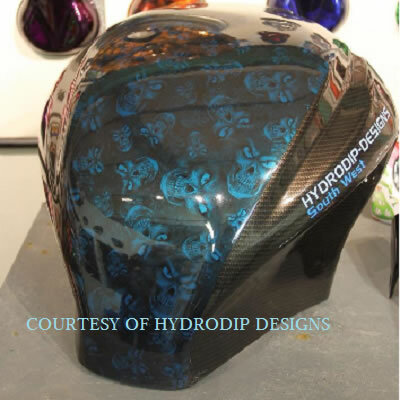 It’s advantage over screen printing, spraying, airbrushing and vinyl wrapping is it is possible to get very consistent pattern coverage over very irregular shaped objects not possible by any other method. Once printed, it is covered in a Gloss, Semi-gloss or a Matt protective lacquer which makes it as tough and durable as an automotive paint finish. The process itself isn’t new and has been used in the mass production of automotive interior trim for many years with the majority of the wood and carbon fibre effect in cars actually being fake .Whether you drive a Ford or a BMW, that high quality piece of trim is in fact printed plastic which has been lacquered, giving a very life like wood or carbon look. 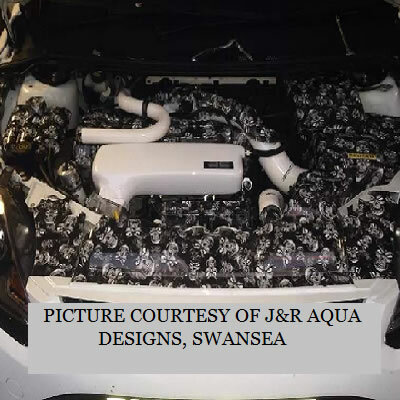 Other areas of use include the customisation of other car parts, including wheels, wing mirrors and exterior trim. The camouflaging of hunting equipment including guns, knives, water bottles and binoculars. Paint balling equipment, golf clubs and other sporting goods. Motorcycle and quad bike panels, all kinds of helmets from Motor cycle to cycling, welding and construction hard hats. Mobile phone cases and covers. The casings for household electronic appliances from computer monitors to games consoles and controllers. Any other household object or ornament can be transformed either giving old objects a new lease of life or if you’d prefer, giving something new a more authentic old school feel. And with the added combination of different base colours, the possibilities are endless.